Studies have shown that neighborhood food environments are important influences on dietary intake and may contribute to health disparities. While instruments with high reliability have been developed to assess food availability, price, and quality, few measures to assess items associated with the physical and social features of food stores have been developed. Yet, recent qualitative studies have documented aspects associated with such features of urban food stores that are barriers to food acquisition. 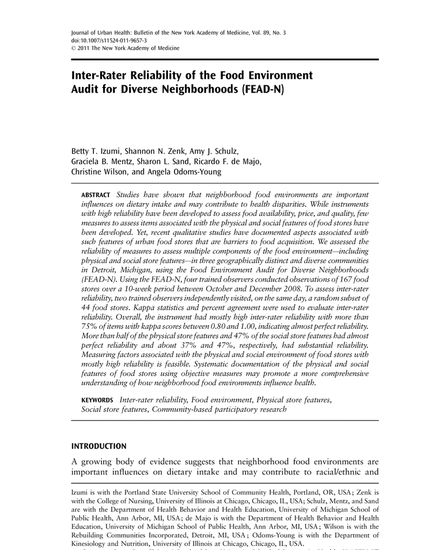 We assessed the reliability of measures to assess multiple components of the food environment—including physical and social store features—in three geographically distinct and diverse communities in Detroit, Michigan, using the Food Environment Audit for Diverse Neighborhoods (FEAD-N). Using the FEAD-N, four trained observers conducted observations of 167 food stores over a 10-week period between October and December 2008. To assess inter-rater reliability, two trained observers independently visited, on the same day, a random subset of 44 food stores. Kappa statistics and percent agreement were used to evaluate inter-rater reliability. Overall, the instrument had mostly high inter-rater reliability with more than 75% of items with kappa scores between 0.80 and 1.00, indicating almost perfect reliability. More than half of the physical store features and 47% of the social store features had almost perfect reliability and about 37% and 47%, respectively, had substantial reliability. Measuring factors associated with the physical and social environment of food stores with mostly high reliability is feasible. Systematic documentation of the physical and social features of food stores using objective measures may promote a more comprehensive understanding of how neighborhood food environments influence health.